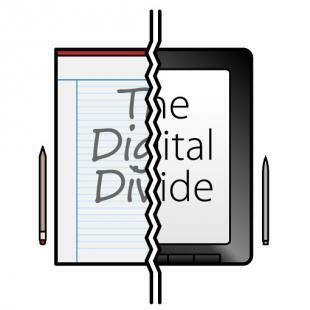 The Digital Divide: Bridge that Gap! In today’s ever-increasingly technological world, being digitally connected is essential to social, political and economic advancement. Technology has revolutionized the way we learn, teach, communicate, and carry out even the simplest of tasks. The Internet is becoming a basic necessity in any field, and providing others with this resource will contribute to workforce development. The digital divide is described as the gap between individuals with and without access to technology, such as personal computers and the Internet. The digital divide is not just limited to underdeveloped or developing countries. The issue exists in developed nations, both domestically and internationally. The lack of resources largely contributes to the digital divide. There is not enough financing that allows equal access to everyone. This results in disadvantages within some communities. Many employers expect individuals to be able to use certain technologies, and are more inclined to hire those that have had experience. More affluent communities have funding that can be spent on creating computer labs, teaching people how to use technology, and additional types of necessary support. In contrast, poorer communities are unable to allocate as much of their funds to provide the same services. Understand Social Context In order to solve the digital divide, we must first understand the social context in which the technology is used. It’s important to consider that in some countries, there are more important things to worry about than access to technology. It’s difficult to determine where funds should be allocated—especially if technology is not deeply integrated into the lives of the people. There are countries that live off of agricultural development rather than industrial operations, where the technology that we use may not be relevant. Increase Social Media in Developing Countries Social media sites such as Facebook and Twitter are platforms in which people share information about current and trending news. Those without access to technology could find themselves left behind and uninformed. Understanding and staying up-to-date with the rest of the world will empower individuals, and allow them to contribute positively to society. It’s important that the digital divide not only bridges the gap between consumers of the Internet, but also the producers of content. Active engagement requires both give-and-take, and individuals should be taught how to provide information for others, rather than constantly consuming information. Encourage Education in Developing Countries To begin, countries should be encouraged to invest more in education, which can later be paired with the introduction of electronic devices to the curriculum. In the past, there have been ideas to install computers and hand out laptops to children in third world countries. For example, surfing the Internet could provide a plethora of answers that could help resolve issues farmers may face. However, low literacy rates entail that many students will be unable to comprehend the content on their screens, and therefore will not be effective until students learn to read and write. Once a strong foundation has been established within school systems, it will become easier for students to turn to online education for further enrichment. Online courses will not replace the traditional classroom setting–rather, it will exist to teach skills and subject that are not traditionally offered in schools. In some circumstances, such actions alone will not produce positive outcomes. It will be a combination of that and other interventions appropriate for the given social context that will allow individuals to benefit the most. The Digital Age has been an extremely transformative process, and bridging the digital divide will further improve the quality of life of individuals around the world. How will you address the digital divide? Please let us know in the comments below!